One of these days, I’m going to fall flat on my face. I just hope that when it happens, I’m not walking on a trail with mud puddles—or worse, one of those trails with sharp pointy rocks. That would be a dangerous place for a face-plant. I guess it’s one of the hazards of being an artist who loves hiking. I get distracted by the scenery—clouds, trees, mountains—and forget to watch my step. Emanuel Garcia is an 8th grade middle school student who is inspired by the Impressionists. I often wish the artistic gene came with a specialized mutation—one that gives artists an extra pair of eyes. That way, one pair could watch the trail while the other admires the view. I envision a couple of eye-stalks—like a hermit crab—flexible, so you could swivel them around in all directions. But, being a distracted artist has its advantages, too. I’m probably biased, but I think the world is more interesting when seen through artistic eyes. For instance, when most people look at a tree…they see a tree. But when I look at a tree, I see art. Take an old-growth Douglas fir, for example—one of the most magnificent trees in the ancient forests of the Pacific Northwest where I live. These trees can grow so big, it seems like you could park a car inside the width of their trunks. They tower up into the sky—sometimes hundreds of feet high—and their tops reach into the misty clouds, where their brush-like needles “comb” moisture out of the air, dripping it down to their roots below the forest floor. Imagine that…trees that reach up and grab water right out of the sky! Douglas firs are giant, living beings…marvels of the plant world, but when I walk through the forest, I sometimes forget all that. I’m so distracted by light and shadow, and the lines, colors and shapes, that the forest sometimes melts away and is transformed into art right before my eyes. It’s a way of seeing—kind of like squinting, but more with the brain than the eyes. In my painting-forest, trees become dark, jagged strokes sketched onto rough paper with a soft piece of charcoal and smudged with a thumb. Branches morph into quick, angular strokes from a sable brush dipped in green, brown, and blue, and forest shadows dissolve into swirling puddles of purplish gray. And sprinkled throughout: autumn leaves…spatters of sienna from a stiff bristle brush. Don’t get me wrong—I love forest ecology. I think it’s fascinating to learn how millions of living beings work together to create the whole forest system. The trees are the biggest, most imposing life forms, but there are countless tiny, hidden ones. They’re all busy doing their own specialized things, and they’re all contributing to make the forest work. But when I’m going for a forest walk, I usually let my imagination float into watercolors. I guess it’s no wonder I stumble a little now and then. And I’ll let you in on a little secret, too. Often, when I’m with a friend and we’re talking, I find my attention wandering. I nod and pretend I’m listening, but actually, I’m concentrating on their face—imagining drawing their portrait, tracing the angles and curves of their features, mixing colors to capture light and shadows on their skin or hair. It’s true, you know…what they say about human beings. We’re all beautiful, no matter what we look like. Maybe not movie-star beautiful, but interesting—at least to artistic eyes. So, the next time you’re chatting with an artist, if you happen to notice they’re nodding and saying “Uh-huh…yep…mm-hmmm”, and maybe staring just a little too intently at your face, consider this: they may not be listening to you at all. They may be painting your portrait in their mind. Don’t sweat it, though. They’re seeing beauty. No matter what you look like. And if you go walking with an artist—especially in a forest—keep an eye on them. If you notice their gaze wandering up to the sky, or off into the distance, or anywhere but down at their feet…maybe take their arm and guide them around the trip hazards. Because, even though we’re all beautiful—artistically speaking—no one looks good after they’ve face-planted into the mud. Emanuel Garcia, an 8th grade middle school student, lives at home with his mother and brother. He is very involved in sports playing soccer, wrestling and baseball. He manages all this and maintains a 3.5 GPA in his classes. After studying the Impressionist period of Art, Emanuel was inspired by the manner in which the Impressionist artists worked with light. 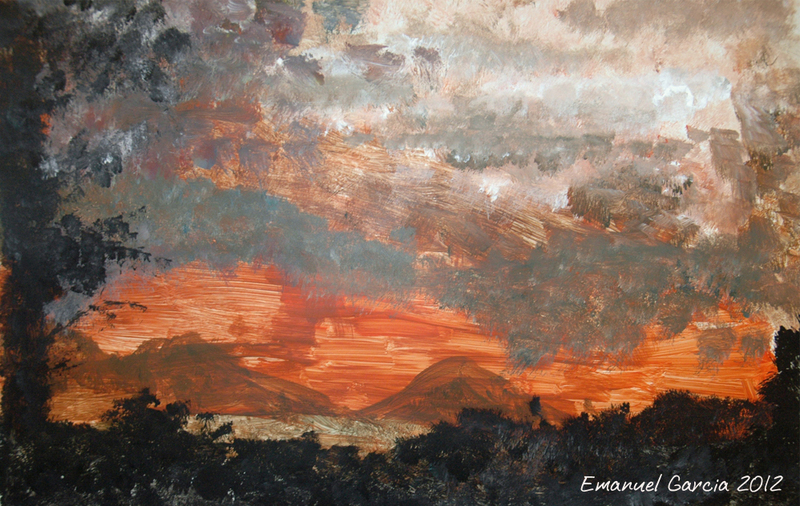 Intrigued by the colors and peaceful solitude of sunsets, Emanuel created a sunset of his own, hoping to capture nature’s beauty in his painting. Thank you Emanuel! Keep up the great work! WOULD YOU LIKE TO SHOW YOUR STUDENT ARTWORK ON THIS BLOG? I’ll be featuring student artwork from time to time. If you are 18 years old or younger, and are interested in being a guest artist on this blog, or if you are a teacher and have a student you think would be interested, contact me at denise@dahndesign.com. I’ll reply to your email and let you know more about the submission process. This is how it works: you supply the art—anything related to nature, any style, any medium, and I’ll write the post to go with it! Want to know whenever I publish a new post? Sure you do! Just enter your email address in the “subscribe” box in the left-hand sidebar on my home page. You’ll get an email notice each time a new post is published. That’s all there is to it! Your email will never be shared. If you like the blog, please tell your friends about it or “share” or “like” it on Facebook. (See button in sidebar). And, leave any comments or questions in the box below. I love hearing from you! What do you see when you look at a jellyfish? I love the underwater dome room at the Seattle Aquarium, where I could spend hours surrounded by swimming salmon and halibut, and my favorite: wolf eels. And I love the near-shore habitat exhibits with sea anemones and the tanks with marine mammals—especially the adorable sea otters. 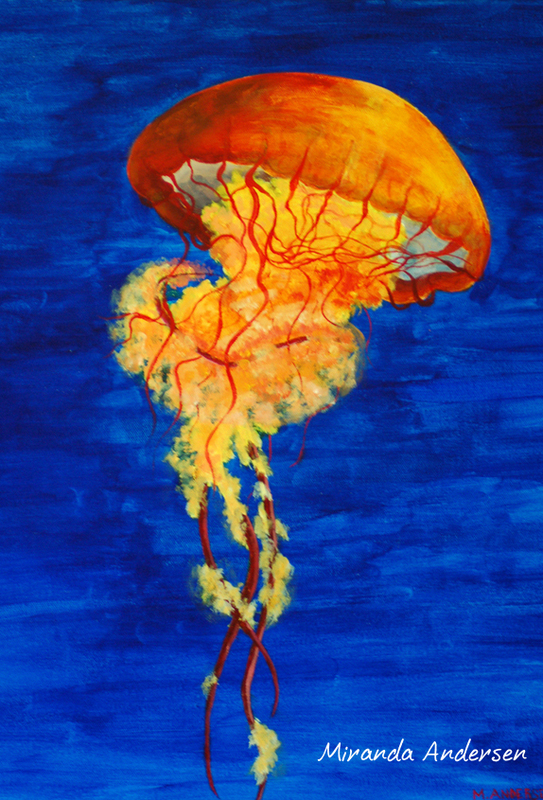 But when it comes to jellyfish…well, no one does jellies like the Monterey Bay Aquarium. The first time I saw their jellies exhibit, it took my breath away. I remember reaching the end of the quiet, darkened corridor, stepping into the exhibit room and feeling like I had entered a different world. The surround-sound classical music, the dramatic lighting, the glowing colors and the graceful, rhythmic movements—had I been transported into the middle of some fantastic underwater ballet? Jellyfish are beautiful, there’s no doubt about that. Even though they are animals, the design of their bodies reminds me of flowers, with brilliant repeating patterns and lacy, translucent, petal-like membranes. They are simple creatures, with no brain or organs —only a mouth, a stomach and gonads. They move by contracting their bell-shaped bodies and propelling themselves through the water, but mostly, they float, drifting wherever ocean currents take them. It’s also amazing to consider that these animals are some of the oldest creatures on earth. Recent fossil finds in Utah have been dated to half a billion years old. That’s millions of years before life first existed on dry land, and hundreds of millions of years before the age of the dinosaurs. And unlike so many of their contemporaries who went extinct, jellies are still around. They must be doing something right. In fact, some people think jellyfish are a little too successful. Recent “blooms” of jellyfish populations may be signals of major disruptions to coastal ecosystems. Some blame overfishing, which eliminates the top predators of marine habitats and allows jellyfish populations to explode. Others think pollution and global climate change are more to blame. When I look at jellyfish, my mind drifts back to the distant past, to the early eras of life on earth when evolution was sorting things out with millions of years of trial and error. I also think about the future and the challenges we face with accelerating changes in earth’s ecosystems. But mostly, when I look at jellyfish, I’m right in the present moment, being hypnotized by the pulsing, rhythmic dance of those delicate underwater flower-creatures. What do you think of when you look at jellies? Miranda is a 13 year old and documentary filmmaker who produced her first film at nine years old. The film is about a local hatchery and the threats to both the salmon population and habitat. Other documentaries followed, including, in the fall of 2011, a piece called “Forever Plastic” about a Vancouver resident who is trying to live plastic-free. The film also features a story about the Great Pacific Garbage Patch in the Pacific Ocean. Another of her films, documents the efforts of a sociologist turned artist, who is bringing attention to the issue of global deforestation. Another one of her films was on the topic of e-waste (electronic waste), and features an ethical e-waste recycling organization called Free Geek. She is currently working on a film on the subject of nature deficit disorder and recently visited the author who coined in the phrase in San Diego. Miranda’s films inform people in a visual way about environmental issues. Through her documentaries she has become a sought after speaker and source of information in her community. And, as you can see, she is also a very talented painter! Watch a short video where Miranda discusses her work. LEAVE A COMMENT! Anything at all… Tell me about your favorite aquarium, if you’ve ever seen a jellyfish in the wild, what jellyfish remind you of, or what you had for breakfast! If you’re shy…don’t leave your real name. CONSIDER BEING A SUBSCRIBER! Never miss another post. You’ll get a notice emailed to you whenever I post something new. Just fill in your email in the box on the left sidebar. I won’t share your email with anyone. SHOW YOU CARE: SHARE! Help keep this blog going by spreading the word. Click like on Facebook or share the link to a particular post on your Facebook page. Tell your friends! Spreading the word will keep this going and help more people connect to nature in their everyday lives. WOULD YOU LIKE TO SHOW YOUR STUDENT ARTWORK ON THIS BLOG? I’ll be featuring student artwork from time to time. If you are 18 years old or younger, and are interested in being a guest artist on this blog, contact me at denise@dahndesign.com. I’ll reply to your email and let you know more about the submission process.